If you would like to organise your own fundraising event for the Amy Winehouse Foundation, then we would like to make this as easy as possible for you. Here is some general information giving you some ideas for fundraising activities and a little bit of guidance on what makes a successful fundraising event. Whether you want to jump out of a plane for the Foundation, hold a big party for all your friends or put on your own gig to showcase your talent… anything is possible! To make the whole process easier you can now set up your own Amy Winehouse Foundation fundraising page in minutes by following the link below, which means your friends and family can sponsor you at the click of a button, and you can easily keep track of your progress without all the paperwork. With just a few clicks, you can set up a Just Giving page and start raising funds for the Foundation! Once your page is set up, Just Giving will tell you the very best ways, old and new, to share your page with more people, with top fundraising hints that have helped fundraisers raise over £700 million on JustGiving. Once this is done, you may wish to register your event with us using this online form. Once you have submitted the form we will send you a fundraising pack which will contain either the ‘in aid of’ or ‘supports’ Amy Winehouse Foundation logo to use for your publicity. When you are fundraising for the Amy Winehouse Foundation, you are acting “in aid of” or ‘supporting’ the Amy Winehouse Foundation, rather than “on behalf of” or “representing” the Amy Winehouse Foundation. This means that you are independent of the Amy Winehouse Foundation and what you do does not fall under the Amy Winehouse Foundation’s control. We have special “in aid of” or “supports” logos that we will send you once your event is registered. And please ensure you have permission to use any images or text – although some material is available without copyright instructions, do not assume that all materials are copyright free. The Amy Winehouse Foundation cannot take responsibility for what you do as a volunteer when you are fundraising “in aid of” the Amy Winehouse Foundation. It is not acceptable to collect money in the street or do house to house collections in the name of the Amy Winehouse Foundation. For certain events, such as raffles, lotteries or public entertainment you may need a licence or permission from the local authority. Please make sure you have researched and implemented any necessary licensing requirements before your event takes place to make sure you are covered. The Amy Winehouse Foundation cannot accept liability for your event, so please make sure that you have appropriate insurance in place for the activity or event you are carrying out. Check whether your chosen venue has insurance in place that will cover what you are planning. In particular, where children or young people are involved, this should include an appropriate level of safeguarding preparation and adult supervision, checking children have permission from their parents or guardians, and carrying out appropriate background checks if adults are to have unsupervised access to children. Ensure more than one person counts any funds which are raised. All funds collected should be sent to the Foundation within four weeks of collection, either by cheque payable to Amy Winehouse Foundation, Paypal or via your Just Giving fundraising page. The Amy Winehouse Foundation is proud to support a charity that is helping vulnerable young people through mentoring. ‘Friendship Works’ provides this help across the London boroughs of Camden, Islington and Southwark, pairing adult mentors with children and young people aged between five and sixteen. Many of these young people face problems such as social isolation, learning or behavioural difficulties, bullying or other challenges at school, or are young carers for parents with health problems. The Foundation was hugely impressed with what Friendship Works has achieved so far, and at how the charity is giving young people the chance to develop important life skills while at the same time, allowing them to enjoy activities that other children and young people take for granted, such as a simple trip to the cinema or visit to the park. It is for these reasons that the Foundation has provided decided to support them with a £20,000 grant. Jane Winehouse, who is a trustee of the foundation set up in her stepdaughter’s name, says: ‘On our visits to Friendship Works’ services in London, we saw first hand how positive an impact a mentor can have. They can be there for a young child, offering friendship, a connection to the adult world; but they can also help that child open up about things, and feel confident about making decisions that affect their life. ‘By helping to fund Friendship Works, we are helping children and young people explore their potential, build their confidence and help them realise their hopes and aspirations for a brighter future’. 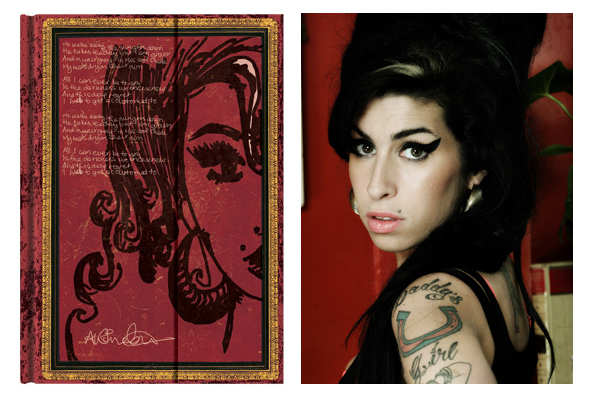 Paperblanks are excited to be able to tell you about the newest addition to the Embellished Manuscripts Collection, the ‘Amy Winehouse, Tears Dry’ journal. Designed in partnership with the Amy Winehouse Foundation, this book features a self-portrait of the British singer alongside her signature and lyrics to one of her most recognizable songs, ‘Tears dry on their own’. Royalties from the sale of this journal will go to the Amy Winehouse Foundation. This global charity helps prevent the effects of drug and alcohol misuse on young people. The Amy Winehouse Foundation was set up by her family in memory of Amy and it also aims to support, inform and inspire vulnerable and disadvantaged young people to help them reach their full potential. Hoping to inspire future songwriters, writers and poets the Embellished Manuscripts Collection features famous artists, writers and philosophers, and creates a space for people to write their thoughts or works of art of their own. The ‘Amy Winehouse, Tears Dry’ journal comes in Mini, Midi and Ultra size. Watch Highlights From The Amy Winehouse Foundation Ball! The Amy Winehouse Foundation Ball, held at the Dorchester Hotel, London, on November 20, 2012, proved to be a great success, with over £100,000 raised for the charity. Our biggest event to date was attended by a number of celebrities, including Mark Ronson, Salaam Remi and Ronnie Wood. This video shows the highlights from a truly memorable evening. The Amy Winehouse Foundation has teamed up with wristband manufacturers Wayveband to produce Foundation-branded bands. The bands retail at £5, with £1 going to the Foundation. Made from quality, 100% recycled leather, Wayvebands can be pretty much whatever you want them to be. To purchase this item, click here. The Amy Winehouse Foundation has linked up with giveonthemobile – giving supporters the chance to donate and raise funds while using their smartphones. giveonthemobile® is a mobile app that lets you keep up to date with what’s happening at AWF and makes it really easy for you to donate to AWF, an AWF fundraiser or one of our campaigns. The app is free to download and is available for iPhone, Windows, Blackberry and Android phones which also includes easy PayPal donations. For those of you who may not have a smartphone you can donate to AWF by texting “AMY” to “70007”. This is a great way to support Amy’s Legacy and we are working with the team at giveonthemobile® to bring you great rewards in thanks for supporting our cause over the coming months which could include merchandise and priority bookings for events. giveonthemobile® was voted as Consumer App of the week in the Guardian Newspaper and has been awarded 10 out of 10 in iPhone and iPad essentials magazine. You can download the app from your app store under giveonthemobile (all one word word) or if you are feeling a bit lazy just type http://gotm.mobi into your phones web browser and the team at giveonthemobile® will do the rest. Earn Money For AWF When You Shop Online! The Amy Winehouse Foundation has linked up with Everyclick and Give as you Live – giving supporters the chance to raise funds while shopping online. Give as you Live is a web-based product from Everyclick that allows shoppers to turn every pound spent online into a free donation for any UK cause. Thousands of online retailers, offering millions of products, will donate a percentage of each purchase to any cause a shopper selects. It costs the shopper nothing to Give as you Live as the stores donate the money, not the shopper. The shopper can pick from over 220,000 UK causes to donate to and, on average, 2.5% of each purchase can be donated. Give as you Live works with existing online affiliate programmes and our partner retailers pay a commission on each purchase made through Give as you Live which Everyclick simply redirects a percentage of the commission to any cause the shopper selects. Give as you Live is a great way in which you and your supporters can raise funds for the charity just by shopping online – if you haven’t tried it yourself yet, please give it a go! The Amy Winehouse Foundation Golf Day – the first fundraising event held specifically by the charity – raised over £20,000 on May 24. Held in glorious weather at Stock Brook Golf and Country Club, guests enjoyed a round of golf, followed by a gala dinner in the evening. Those in attendance included Ray Winstone, The Voice finalist Vince Kidd, and new patron Barbara Windsor. The Foundation offers its thanks to everyone at the golf club, as well as all who attended.